Google Pixel 3XL will be launched in October. Google has come to know about the date of this premium smartphone launch but news sites already leaked image. According to media reports, this smartphone can be launched on October 9 next month. Apart from the Pixel 3XL, another premium smartphone OnePlus 6T can also be launched next month. This smartphone was released during the Asia Cup 2018 match, in which Amitabh Bachchan is appearing with this smartphone. About the date of launch of the phone, it is also estimated that the phone will be launched at 11 a.m. on October 17. 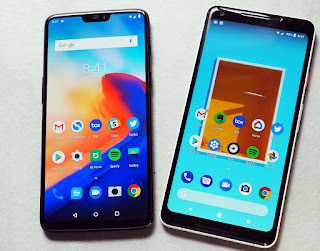 Let's know about the features of these two smartphones. According to the recently leaked features, latest Qualcomm Snapdragon powerful Processor 845 can be given include in this smartphone. Also the phone can be launched with the initial variant of 4 GB RAM and 64 GB internal memory. Google's latest Android device can be given Android latest version 9.0 Pie in the phone. To give power to the phone, 3,420 mAh battery can be given. It is also being said that the phone can come with a 6.7 inch full HD Plus display. A 12 megapixel rear camera and 8 megapixel selfie camera can be given in the phone. The phone's camera can come with support AR features. Talking about the innovative features of this smartphone, it can be given a 6-inch Full HD Plus display. Also a big knock can be given at the top of the display. There can be a single rear camera and dual front camera. This smartphone can also be given Qualcomm Snapdragon 845 SOC processor. This phone can also be launched in the initial variants of 4 GB RAM and 64 GB memory. Let us know that the company has not given any official detail related to this smartphone at this time. However, talk about leaked photos and features a few days ago, this phone will also come with Qualcomm Snapdragon 845 processor like WinLS6. Apart from this, many more new features can also be added in this. Phone Android's latest operating system can come with Android 9.0 Pie. In addition to the phones display features, it can be given a full screen display of 8.45 inches. The phone's screen can be HD Plus optic AMOLED. In addition, the 3.5mm audio jack will not be given in it. The phone can be given a USB C type earphone which will save battery. In-display fingerprint sensor can also be given in this smartphone.